I left without having any claims and most of all without having the slightest idea of what to expect. What I mean is that even if I searched the Internet to get information about its temperature and similar subjects at this time of the year, I did not go further than that. And that was on purpose because I wanted to experience that gathering without any previous mental memory, in short I wanted to feel only with my heart everything that would come to me. So I left without any expectations at all. I usually pray a lot, but in my peaceful apartment, in my warm bed, in the dark of night, after the daily routine is over. I pray for those who need it, in absolute silence deep-down my heart, where only the infinite love of my Father echoes back to me. I pray intensely, I have a strong confidence in Father God, nevertheless I am not a church-goer at all … actually I almost feel ashamed to admit that I forgot how the church services take place. I have not been confessing my sins for years. I have not been taking the host for years. I have not been taking part either to the midnight Christmas Mass to celebrate Jesus’s birth or Easter, but I never fail to do it with my heart, surrounded by my wonderful family. While I was getting my tiny bag ready, I only asked for a small sign that they were close to me. Having said that, my sister and I left on the night of 18th October 2007 for Medjugorje together with a group of Croatian pilgrims. 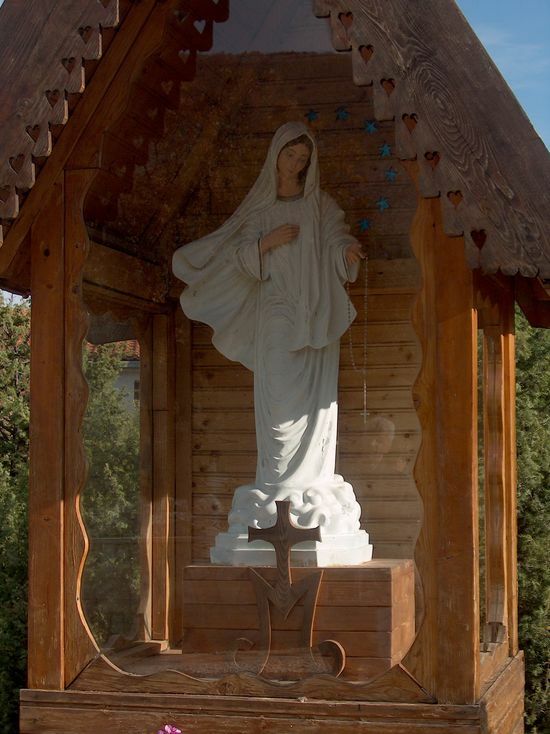 I have already told you, just before I left, how I found myself in a flash with a booked pilgrimage to Medjugorje. The peculiar making of this reservation and taking a trip with a group of Croatian pilgrims personally said a lot to me …here they had already had a hand in it. We were quickly (without any breakfast) taken to the foot of the Krizevac where we began the visit of the Cross Stations. I never did anything similar before, so I had absolutely no idea of what to expect. When I take a walk in the mountains, I usually cannot walk twenty metres uphill if I do not have a lot of sugar in my blood, because I have got a low blood glucose level ! But there I was, with an empty stomach, among prayers, clambering up a path full of stones, breathing in air that would literally fill me up and soothe my soul at the same time and then, in no time, I found myself not tired at all, on the top of that mountain where a Holy Cross about 7 metres tall, erected in 1933 for the 1900th anniversary of Jesus’s death, towers over the place. Then, as I was walking down, I said “Sweet Mother, thank you for what you have just given me, but I would be enormously pleased if I could see you". The gathering was fixed at 6 p.m. in church to attend Mass. To make a long story short, I cannot stand too long on my feet, especially when too many people are squeezed together, I cannot bear it, it is the end ! I just pass out and fall to the ground…it is funny but so it is. You can imagine when I got there and saw the Church’s doors overflowing with people……like ants, they were all there : some of them were standing, others sitting, wearing headphones and carrying little radios tuned in the frequencies in order to follow the Mass in their own languages. I never saw anything like that before : for me it was all completely new. I wholeheartedly wanted to attend this Mass, but I was terrified at the thought that I might have fainted: I would have never been able to make it. So I turned to Holy Mary and I said ‘I will try to get in but you please help me or send your angels at least”. Well, it was really strange : they were all pressed together like ants but where I stood, all around me, there was about 50 cm of empty space !! Some people were pushing to come in, some other people were pushing to get out, they looked like cards being shuffled but right in front of me there was always a little empty space left.! Then I suddenly felt I was choking, but then from the open door behind me a huge wind blow came in and that helped me breathe! And after one hour of Mass (and there they make it last longer than they do here) my legs were giving in (you know, the trip, the visiting of the Cross Stations, and now this…) : I clearly felt someone holding me till the end of the service. I had mixed feelings…it is possible, you know, that I had myself be influenced … but in retrospect, I tell you, it is not so. Because in that place there is a force that even an atheist can perceive. 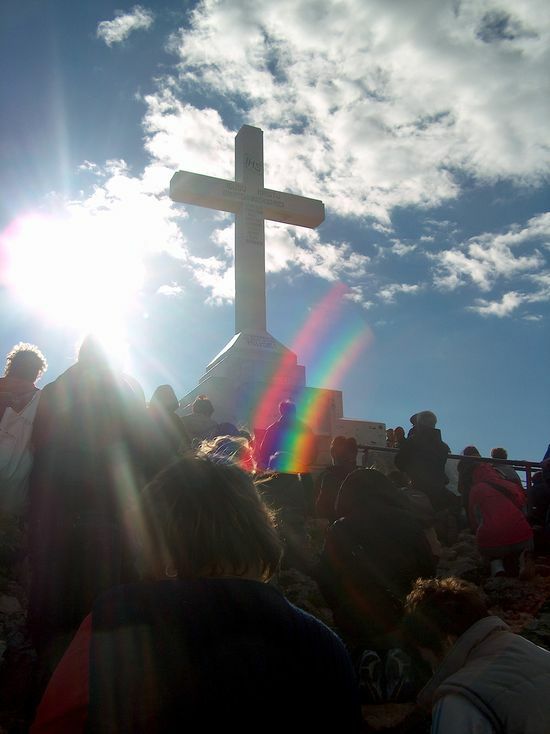 On the next day, Saturday 20th October, a visit to the community of former drug addicts was planned, then a visit of a place named Oasis of Peace, later in the afternoon the climb of the Podbro: the famous mountain of the apparitions. But before all that, the first appointment was with Mirjana – one of the clairvoyants – she spoke in Italian because on that day many Italian pilgrims were arriving. The people belonging to our group, even if Croatians, could understand and speak Italian. So we arrived and stood in front of a house with a gate. Even as soon as at 7.30 a.m. we had to stand there and wait for about, I think, 30-40 minutes, maybe longer. Among prayers and chants (this time in Italian, fortunately) I lifted my nose up and happily glanced at the wonderful clear blue sky, and it was so beautiful that my heart was filled with joy. 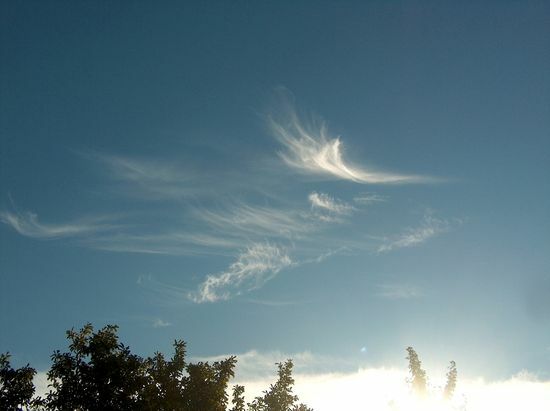 That day appeared to be good, too. All of a sudden she arrived, she began to speak and she said all the things I already know deep down my heart, the truth my heart never forgot… words she also dictated to you, dear Sara…. Well, maybe with an aura of mystery that might leave a little surprised those who maybe have not reached a certain awareness, yet… who have not completely and unconditionally given their hearts to God, yet. And I found myself apparently with no reason shedding large tears of joy behind my dark glasses, tears that really streamed out of my heart. What do you say ? Can you see her ? Even if in horizontal position, I immediately saw her and she could have not given me a bigger gift. I asked her to let herself be seen and she granted my wish !!!! 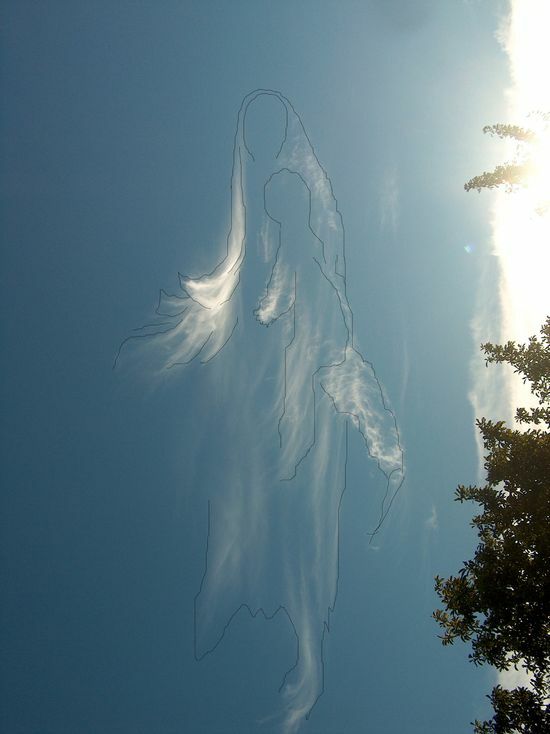 Here I tried to outline her silhouette: she is with the baby and she’s holding a rosary in her hand! Can you see her ? And here below it’s a picture I took about 1 hour later at the Oasis of Peace: does it not look the same to you (only the baby is not there) ? It was possible for the people attending to ask some questions to Mirjana and at the moment I realised how lucky I was and I was grateful for that, too. They were asking her a few questions I found obvious; some of them did not make sense, they were very “earthy”, as if they were starting from the basics of their path of awareness. Someone even asked for her blessing but of course she answered that she could not do that because she was not a priest… All this did not really make much sense to me. I kind of felt like a fish out of water: it was like being in a class of pupils in primary school while I was already attending secondary school… can you see what I mean ? It is not nice to say that, I might sound like someone who “talks big” (like they say in jargon), but this is what I felt. And I was really thankful to God to be so lucky to have my heart – so to say- a little more open than others. And maybe this experience was really useful to make me understand that the biggest mistake I usually make is to believe that all the other people see or feel things the way I do, while in reality it is not so, not for everybody. And this makes me feel bad, because I think of the infinite love I am feeling in my heart and I would like everybody to feel the same, to be aware of that precious gift that we all might receive, but that only a few are still looking for Those people were there, you should have seen them, they were hanging on every word she said, they were awaiting who knows what from her, they were asking absurd questions, (I repeat, they were absurd according to my point of view) and she humbly, very tactfully, told them what the Virgin Mary has been telling her for all these years; I must say that she kindly answered to their questions even though she realised as well that those questions did not make much sense. They were all there, longing for seeing her (the Heavenly Mother) and they should have only looked up to the Sky to see that she was there with them in the only place where it was logical to be, up in the Sky. Great. With her infinite Love, and her son was there too, he was lovingly looking at us, and hugging us, he could have not given us a bigger present. Nevertheless I tell you, in four days I became aware of different things.– starting from my fellow travellers –: some of them go a long way to get there, they visit the Cross Stations even barefoot, they recite the rosary, attend the Mass, do all they can in order to get closer to God, to the Blessed Virgin Mary and to our brother Jesus, but I had the feeling that they were looking for them outside, in the objects, etc. instead of looking in the first place where they should be seeking them, their hearts. Besides they should start with small things of everyday life, respect and help the others (beginning from their own family), live and share with others everything life saddles us with…but I assure you I might give you many examples I witnessed and what I saw was the opposite of what they ask us to do. This made me feel very sad, because the door to go through in order to solve all our problems is in our hearts and we all have got the key to open it up, the problem is that many people – too many people - do not realise that. Very evocative was the Jesus Christ entirely made of brass, 6/7 metres tall, water drops flowing out of his knee: remarkable ! I was very touched by this sight, especially after having those thoughts I told you about a few months ago, regarding the blood tears that now and then the Madonna sheds. It is really shocking to see drops flowing from a metal piece, which symbolically represent Jesus’s blood ! That moment I felt really small, tiny, compared to the immense plan of God, in which everybody has a place. Very touchy were also the prayers said in church: they were penetrating, vibrant, strong, lively, they were said with firm belief and I think I felt my heart vibrate, too. Only a few things have made my heart vibrate like that ! During our walk up the Podbro (the hill of the apparitions), while we were meditating upon the painful mysteries during the rosary, I could feel such a big emotion, which I never experienced before: I cried a lot, feeling in my heart what Jesus, our Lord, had to go through for us. Now 7 days have gone by since my coming back, and today I am still trying to better understand the feelings I had, what I experienced, and what I was given to during this trip. Well, maybe a word that often occurred to me during those last days is BROTHERHOOD. Yes, there in Medjugorie unity among people is underlined thanks to prayers. To see men and women - brothers – of any nationality (re)united to pray a common Father injects an indescribable warmth into your heart; Italians, Swiss, French, Slovenians, Germans, Croatians, Bosnians, Americans and Chinese! Yes, Chinese. I was moved to see how they were praying, knowing that even today, in 21st Century they are not free to profess a religion in their own nation, in their homes – like they were not, not a long time ago, in former Yugoslavia –. But just the fact that they were there brought back to my heart and mind the words of the message the Blessed Virgin Mary gave me to answer my question to the Sky. That being so, today I can understand much more deeply what she meant. Simply, at present, the word that occurs to me is’ ‘MARVELLOUS’ and what I am feeling in my heart is “JOY and LOVE”. I hope to hear from you soon, a loving embrace.